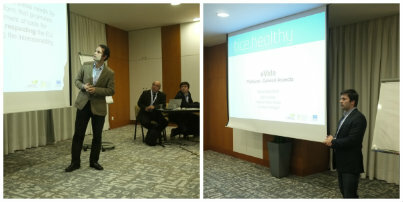 On last 20th November, the TICE.Healthy project organized the workshop "eVida.pt platform: your ecosystem of applications and ICT services for health and quality of life" in collaboration with Global Health Conference 2013. It took place at Hotel Mercure, in Lisbon, Portugal. In this workshop were presented the advantages, both technical and economic, that the eVida.pt platform provides to the different stakeholders and engaged with the audience a constructive discussion about the exploitation opportunities and potential barriers. The workshop also provided perspectives from different areas where the eVida.pt platform can be used and provide a service and application ecosystem. The caregiver perspective showed how the platform can support them and help to provide services for healthy ageing to their clients. The developing countries perspective showed that such an open platform can also be used to provide a service infrastructure to support areas or municipalities, with currently fewer infrastructures and services for their citizens available. The third part of the workshop was more technical and showed the first steps and the process of application and service development, with reusing the common component infrastructure (security features, the PHR (personal health record), user authentication etc.). This part also explained how the services can be deployed and provided to the end user. The workshop encouraged developers and service providers to use the platform and think about applications which can contribute to the overall service ecosystem.